Joe McGinniss's new book, The Rogue: Searching for the Real Sarah Palin, hits bookstores next week, but its controversial claims about the former Alaska governor are already making waves. 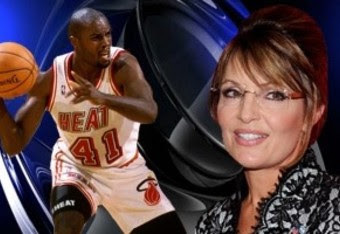 In the book, McGinniss writes that Palin had a one-night stand in 1987 with future NBA basketball player Glen Rice nine months before she married her husband Todd. He quotes a friend who said Palin "had a fetish for black guys for a while." "She was a gorgeous woman. Super nice. I was blown away by her," Rice tells McGinniss in the book, NBC reports. "Afterward, she was a big crush that I had." McGinniss's book also alleges that Palin had an extramarital affair with her husband's business partner, Brad Hanson, in the mid-1990s, and snorted cocaine off a 55-gallon oil drum while snowboarding. So here is the real question: What will Sarah Palin do in response to this book? Will she deny, deny, deny, or will she go on the attack and possibly attempt to sue McGinniss for his book? I personally believe the content of McGinniss' book. Palin has done nothing to make me think otherwise, and her self-righteous attitude does even more to confirm my suspicions. I am also interested in what McGinniss has to say about Trig's birth and who his real mother may be. It is also interesting that Palin herself is not denouncing these accusations. Instead, her husband made some stupid response in regards to his wife's dalliances.